» ‘National Law Day Award’ conferred on Prof. Dr. Shivajirao Kadam, Vice Chancellor BVDU by Hon’ ble Smt. Pratibha Patil, the then President of India. » International Collaboration & Linkages: 10 MOU'S with renowned Foreign Universities in UK, USA & Europe. Academic Linkages with Oxford ,Harvard & other reputed universities across the globe. » Innovative and Inter-disciplinary Programmes in emerging areas - BB. A Law & Para-Legal Courses. » Teaching Faculty - retired Judges, Sr. Advocates, academicians, Corporate Personnel - International Knowledge Partners. » ICT Methods of teaching- Clinical Legal Education/ Justice Education. » Recognized under 2f & 12 B of UGC Act. » More than 97 Research articles & 18 books published during last three years. » World Class Infrastructure- Seven storied building with Moot Court room, Cyber Cell, Legal Aid Cell, Placement Cell, Auditorium etc. » Human Rights & Women Empowerment Cell. » Rich Library more than Rs. 1.7 crore with Computer Cell. » Excellent Performance at International Moot Court competitions. » Free Legal Aid & Legal Literacy Programmes through Legal Aid Clinic. Free Family Legal Aid Centre established in 2012-13. » Online Legal database- MANUPATRA, WESTLAW,SCC Online,LEXISNEXIS etc. » Excellent Placement at national & international firms- internship at Supreme Court, High court, Law Commissions & NGOs. » Foreign Students Cell- Foreign students from UK, USA, Europe and Middle East Countries. » Paper presentation at international conference at Oxford, Harvard, Poland & China. » Prof. Dr. Mukund Sarda was invited as resource person by the University of Oxford, UK. » 38 students pursuing PhD. » Alumni association registered- emphasis on role of stakeholders. » Outstanding performance at curricular & extra-curricular activities. » Organization of national seminars & workshops more than 110 Judges from High Courts & Supreme Court have delivered legal discourse. » Guidance & counseling to the students from Sr. Advocate Ram Jethmalani, Soli Sorabjee, P.P. Rao, Abhishek Manu Singhvi, M.C. Mehta, Geeta Luthra and Pinky Anand etc. » Student Dialogue with Member of Parliament - Rahul Gandhi, Supriya Sule, Shatrughan Sinha, Madhu Gaud Yakshi, Ranjit Sinh Mohite Patil etc. » Holding of Mock Parliament, Arbitration, Client counseling, drafting of legal documents. » Training for judicial Examination and bar examination. 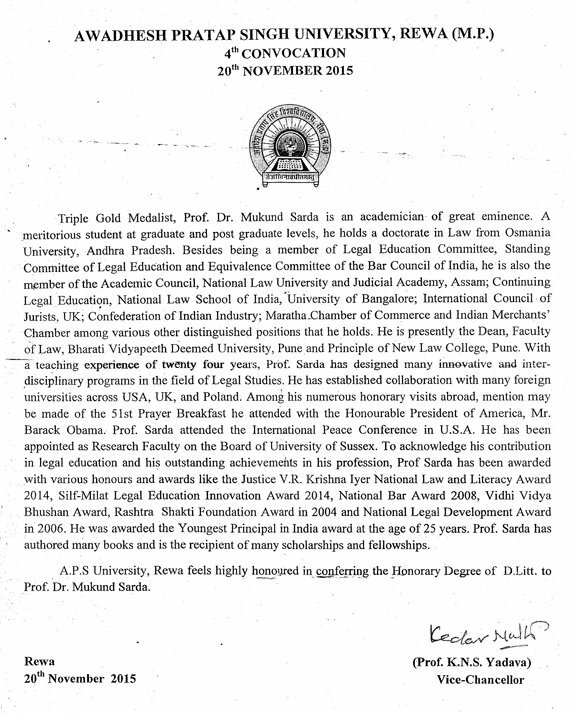 » Outstanding Alumni - Judges of Supreme Court, High Court, District Court, JMFC,Sr. Advocate, Corporate officer, legal advisor, Income tax officers, LPOs, Academicians & Solicitors at UK. » Students of New Law College Ms.Mrunmai Joshi cleared UPSC Examination & More than 90% students qualified AIBE 2013-14. » Distance Education programmes & regular LL.M 1Year /2Years Programme. » Excellent student support facilities, Social Justice to the poorest of poor. » Inclusion of Best practices followed by World Class Universities. » Centre for Continuing Legal Education in association with International Bar Association and MILAT to be established. » Student centric & social justice for poorest of poor are the benchmarks of the institution.